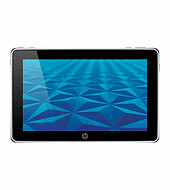 If you have an HP Slate 500 tablet PC running Windows 7, then here are a few tips that can help you. First, there's a quick and easy way to "right click" when you're using your finger. You can do the "tap and hold," but there's an easier method: a single tap followed by another tap with a different finger while you leave your first finger on the screen. Try it. This "right click" trick works on any Windows 7 touch-screen computer that supports multi-touch gestures. Second, if you're looking for an additional pen for your HP Slate 500, you can use the Fujitsu Stylus Part #FPCPN36AP. This is a near-identical N-Trig pen that will also work on the HP Slate 500. Finally, I've found a way to charge the Slate 500 using an external battery back. I'll be posting about that over the next few days so stay tuned! Its a great tip for the hp slate 500.